The 2010-W $10 Mary Lincoln First Spouse Gold Proof Coin is the seventeenth gold coin in a series honoring the spouses of the former Presidents of the United States. As Mary was married to one of the most historically significant Presidents in the history of the United States, Abraham Lincoln, it is likely that her coin will prove more popular than many of the other previous releases in the spouse program. Stipulations are in place for the series in case the President served without a spouse. As seen in the previous release honoring the tenure of James Buchanan, if a President served without a spouse, an image of the mythical figure of Liberty will be used on the coins. Also, if the President had more than one spouse, then both will be featured on individual coins – such as the Letitia and Julia Tyler strikes. 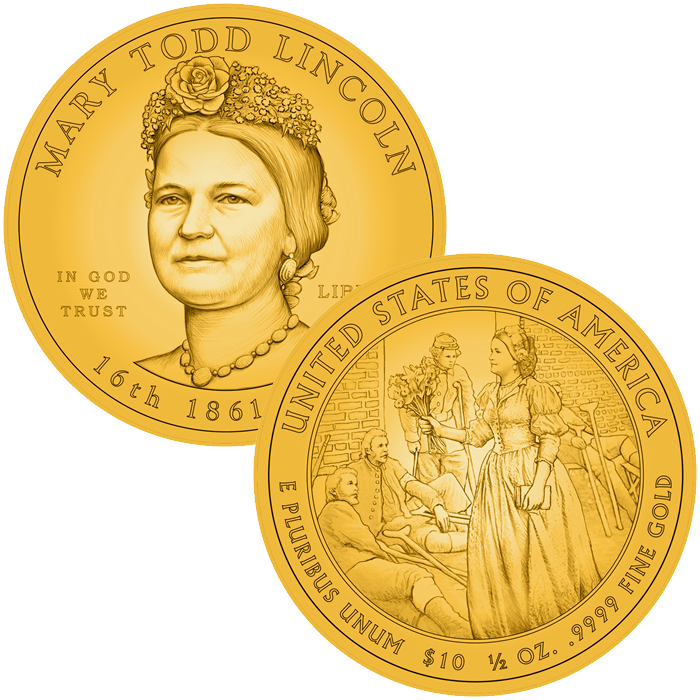 The US Mint has indicated a release of November 2010 for the Mary Todd Lincoln Coin. 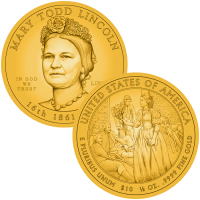 United States Mint Sculptor-Engraver Phebe Hemphill designed and sculpted the stately portrait of Mary Todd Lincoln found on the obverse (heads side) of her coin. The reverse (tails side) was designed by Artistic Infusion Program Master Designer Joel Iskowitz to show Mary Lincoln delivering flowers and books to wounded Union soldiers during the American Civil War. It was also sculpted by Phebe Hemphill.